Researchers identify protein in the brain which inhibits key enzyme implicated in Alzheimer’s disease. The need for a new approach to treatment of Alzheimer’s disease is urgent. Alzheimer’s is the most common age-related dementia and the number of cases in the United States is expected to increase from the current number of about five to six million to 15 million by 2050. The costs to family life and on the health care system are enormous. Alzheimer’s and other dementias are projected to cost the United States $226 billion in 2015 alone, with that number rising to as high as $1.1 trillion in 2050. There currently are no truly effective treatment or prevention strategies for Alzheimer’s, and the available drugs only reduce symptoms temporarily. Now, UCLA researchers have shown that a natural protein fragment produced in the brain can act as an inhibitor of a key enzyme implicated in the onset of Alzheimer’s disease, a finding that could lead to the development of new drugs to treat the disease. The current study found that the protein fragment, sAPPα, inhibits the proteolytic enzyme BACE1. Increased BACE1 activity contributes to production of the amyloid beta aggregates and plaques that are the hallmark of Alzheimer’s. The team state that because sAPPα inhibits the BACE1 enzyme, it may be possible that it can be used to help prevent potentially dangerous increases in BACE1 activity, and thus prevent the onset of Alzheimer’s disease. Previous studies show that the protein fragment sAPPα is normally produced by neurons and is involved in maintenance of memory. The current study shows that this normal brain fragment is also a potent inhibitor of the proteolytic enzyme BACE1. The new finding sheds light on brain regulation of amyloid beta production and could lead to development of new therapeutics. The team employed a technique called small-angle X-ray scattering, or SAXS, and found that the sAPPα inhibition of BACE1 activity is likely due to the unique, three-dimensional structure of the protein fragment itself. Going forward, the team state that they are determining the binding site of sAPP to BACE1 using X-ray crystallography and other techniques. The results suggests that developing sAPPα itself as a biologic, finding a smaller protein or peptide fragment that has similar effects, or identifying a chemical compound that increases levels of this beneficial protein fragment could be new and effective therapeutic strategies for mild cognitive impairment and Alzheimer’s patients. The researchers concluded that these strategies could help normalize brain function and either restore memory and cognitive function, or prevent its decline. The lab surmise that the protein fragment is critical to normal brain function, and creation of a new class of CNS therapeutics that enhance sAPPα may be of benefit beyond Alzheimer’s. They go on to add that the potential drug could also help those who have suffered stroke or traumatic brain injury, and increasing levels of sAPPα may be beneficial in treatment of ALS (Lou Gehrig’s disease). Live cell imaging. 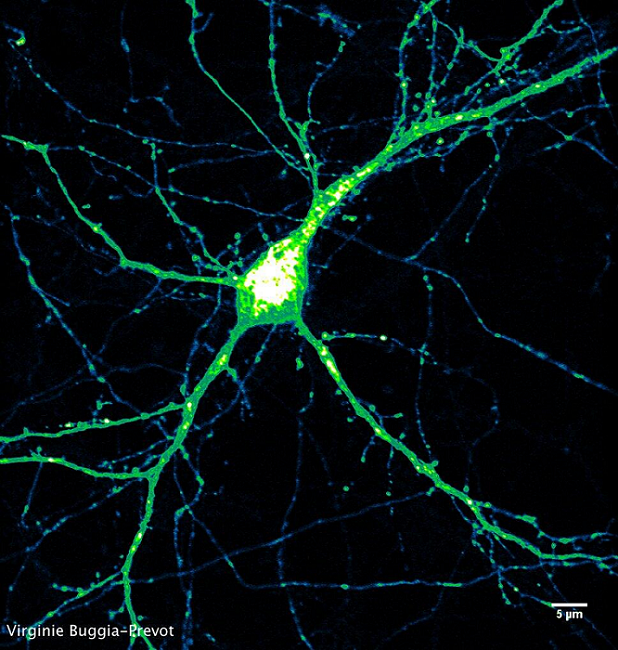 Expression pattern (intensity color coded) of BACE1-yellow fluorescent protein in mature hippocampal neuron. BACE1 is involved in Alzheimer’s disease. Its movement can be tracked from the bulbous cell’s body, through the thicker dendrites and even the finest axons. Courtesy of Virginie Buggia-Prevot, Gopal Thinakaran lab.